Is it cheap to reblog one of your own posts from your own site? Maybe, but I can’t really care right now as classes start tomorrow and it’s almost midnight. Screw it. Here’s a poem I wrote two years ago, when I had yet to become a part of this post-secondary pandemonium, when I was still bright-eyed and fresh, a pristine vessel ready to be filled with the creamy wisdom that college had to offer. No, that wasn’t sexual. Just read the damn poem. (Why the hell this just turned into a Downton Abbey outtake, I have no clue). Those who love reading may be categorized under the general term of “bibliophile.” According to Merriam-Webster Online, a bibliophile is “a lover of books, especially for qualities of format.” It doesn’t get much simpler than “book lover” in the etymological breakdown. Bibliophiles are people who love to read, collect, admire books, etc. And then there is the “bibliomaniac“: someone with “an exaggerated preoccupation with the acquisition and ownership of books” (Free Online Dictionary). This is someone who love books not so much for their content, but for the value of the physical books themselves. If you’re familiar with a certain page on my site, you may have already realized that I have slight bibliomaniacal tendencies. Basically, a bibliomaniac is a book hoarder. How glamorous. And I came back with nine. No joke. 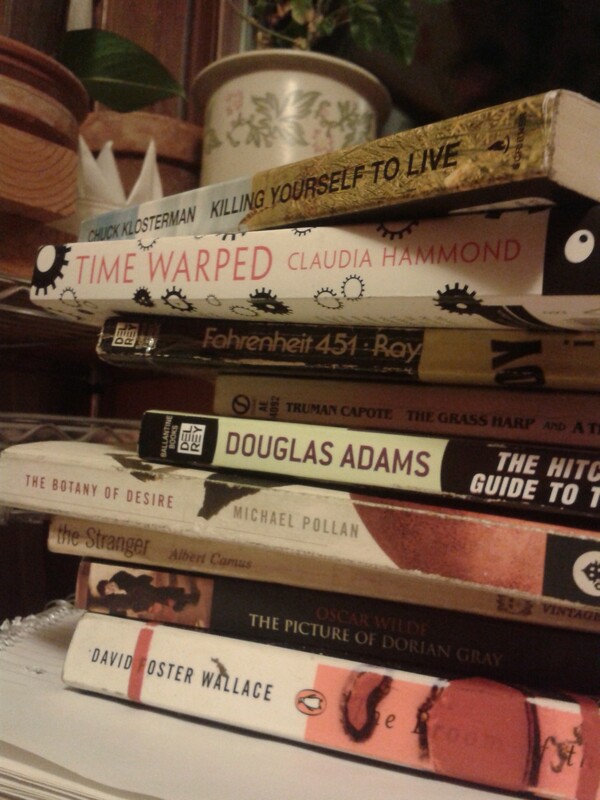 So there’s the thing, I have a tendency to collect books that I think I’m going to read (and by golly, I will!) and books that I think are impressive (I mean, Classics of Moral and Political Theory? Really?) – but I do really like to read as well. I’m not voracious or all that ambitious of a reader. I just like having a book now and then. Sometimes, I don’t quite feel entitled to say that I love to read. True bibliophiles seem to have a new book brushing their noses every week, while I go through periods where I don’t read anything substantial from a book for weeks (not including textbooks and required reading). Therefore am I a noble bibliophile or a poser, a materialistic bibliomaniac? Well, neither, obviously. To even have this discussion- sure, books and reading are great, but they don’t need their own pedestal. Yes, encourage literacy among our children, but there’s no need to ram it down their throats and make them feel bad if they don’t like sitting around reading books day and night. It takes all kinds. And is there a need to shame bibliomaniacs for liking books just because they look nice or have some value not related to their content? Of course not. Obsessing over a first printing of a Dostoevsky novel is definitely not the worst form of materialism. What does bibliophilia/mania mean to you? Where do you fall in the spectrum? And what have you read recently? Share some recommendations in the comments! (As if us maniacs needed more books).